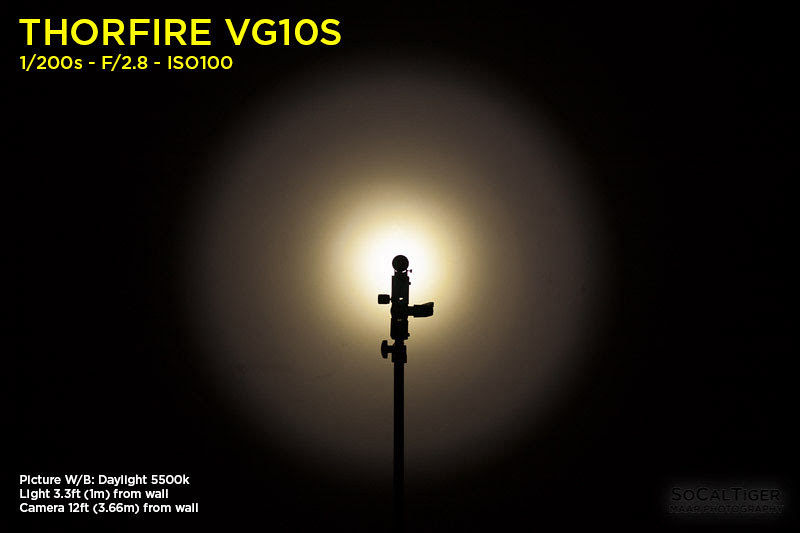 The Thorfire VG10S is Thorfire's upgraded next generation version of their VG10. The VG10S is powered by a single 18650 and is on the large-side of EDC territory. 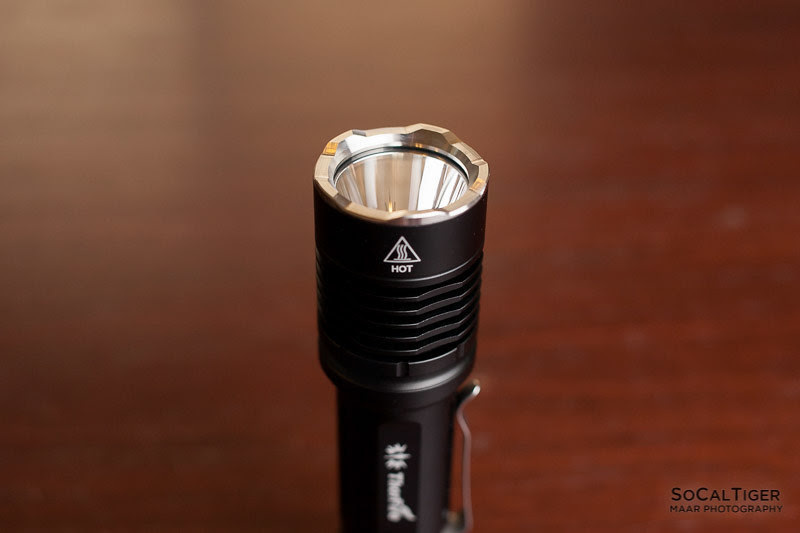 The VG10S utilizes a domed Cree XP-L2 (I believe it is the V6 3D common to the Q8) in a polished reflector providing a balanced general purpose beams Output is speced at a max of 1100 lumens and also has a moonlight mode which I measured at about 0.4 lumens. The VG10S came to me from the factory with a very nice warm-neutral tint of 4500K. Versatile Modes With Memory: Moonlight(1LM)/Low(50LM)/Mid(300LM)/High(1100LM) double tap quickly to activate hidden strobe(1100LM), perfect for medical service, baby care, mechanic checks, power outage, emergency, etc outdoor and Indoor activities. Intelligent Power Saving: After 5 minutes working on high, the light will ramp down to medium mode in 15 minutes to save energy and protecting it from overheating. Durable&Reliable: Made of aircraft-grade aluminum; Waterproof to IPX-8 standard for all weather conditions. Warranty: ThorFire promise to offer 18 month worry free warranty and helpful customer services, if you encounter any question, please feel free to contact us, we are glad to serve you and earn your 100% satisfaction. The VG10S arrived in a standard cardboard box like most Thorfire lights. One difference I noticed from prior Thorfire lights was that the box was taped shut with the label. This is a good improvement because it prevents the box from coming open during shipping. The light is protected in a bubble-wrap sleeve and there is foam padding on the bottom of the box. Accessories included clip (pre-installed), 2 spare O-rings and manual. The packaging is more than sufficient in addition to the mailer packaging. There is no significant risk of damage or scuffing to the light during delivery using this packaging, especially now that the boxes are taped shut. The VG10S has smooth black low-gloss anodizing with some oblong indentations designed into the body and tail. The anodizing was applied well and my copy did not have any notable defects in the finish. The anodizing is also applied to both the head and tail threads. 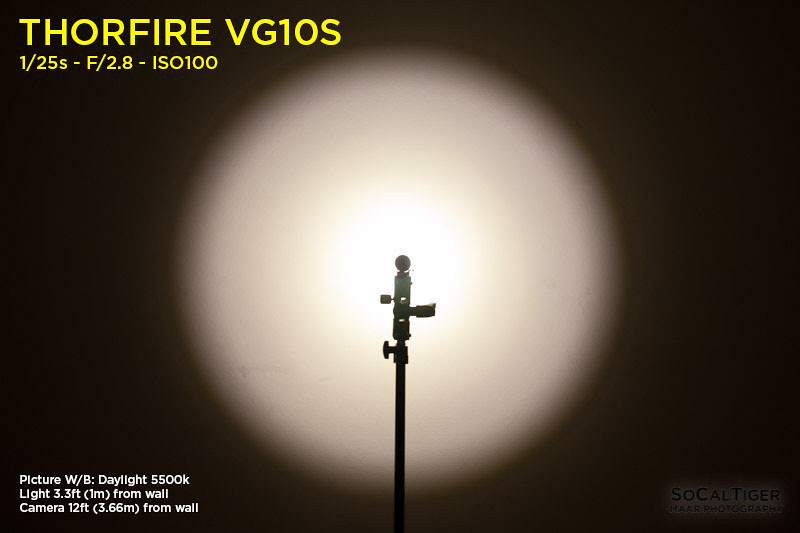 Size-wise, the VG10S is a compromise between a tube light and a larger C8-sized light. 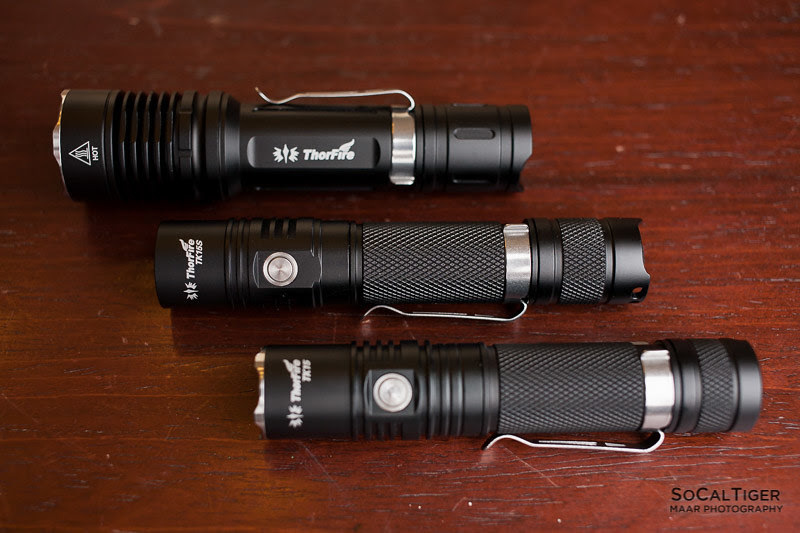 The VG10S will fit fine in larger pockets (like a jacket or cargo shorts) although some may find it a little too wide or too heavy for true EDC use if they are used to using tube lights or smaller. The VG10S has more mass and more cooling fins so it will run cooler than a traditional tube light. 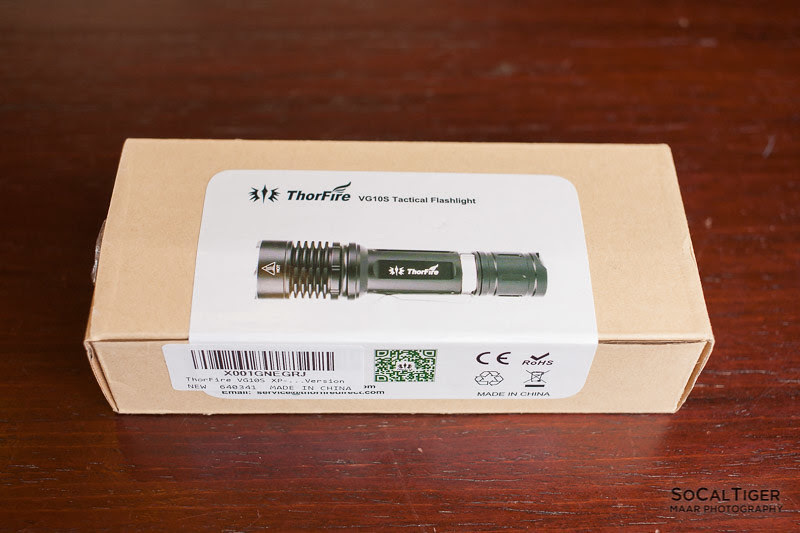 The finish looks good although I would have preferred the knurling that Thorfire uses in most of their other lights (like the TK15 and TK15S). Style-wise, I liked the design of the bezel on the VG10S and it also makes it so that you can tell if the light is turned on when standing on its head. Due to the design, there is minimal roll-resistance unless the clip is attached. Nicely styled bezel. It also makes it so that you can tell if the light is turned on when standing on its head. The threads were cut perfectly square. Anodizing on both the head and tail threads. Springs on both ends. The light uses the tail-switch to control on/off and modes. There is mode memory - the light will activate on the last used brightness. To turn the light ON, press switch fully. To turn the light OFF, press switch fully. To turn STROBE ON, double-click (when on). To turn STROBE OFF, half-press switch (will return to previous mode). * I like that Moon is not hidden. * I wish that double-click did not turn on strobe because it is possible to activate strobe on accident if you are trying to change modes quickly. I think it would be better/safer to hide strobe modes with a long press. * It would be even better if the flashlight was programmable so that you could disable options like strobe, moon mode or mode memory. It would also be nice to be able to program the mode order (High to Low vs Low to High). Measurements were done using a freshly charged EVVA protected Panasonic NCR18650B in a quasi-integrating sphere. 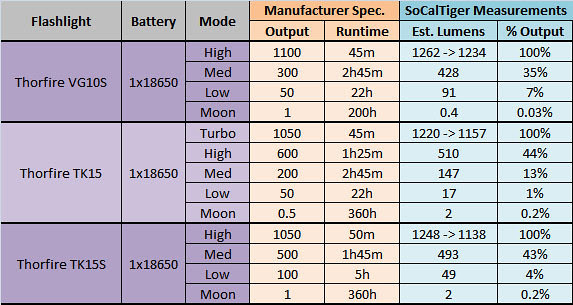 Battery was measured at 4.17V and measurements are taken within 1 hour of charge. 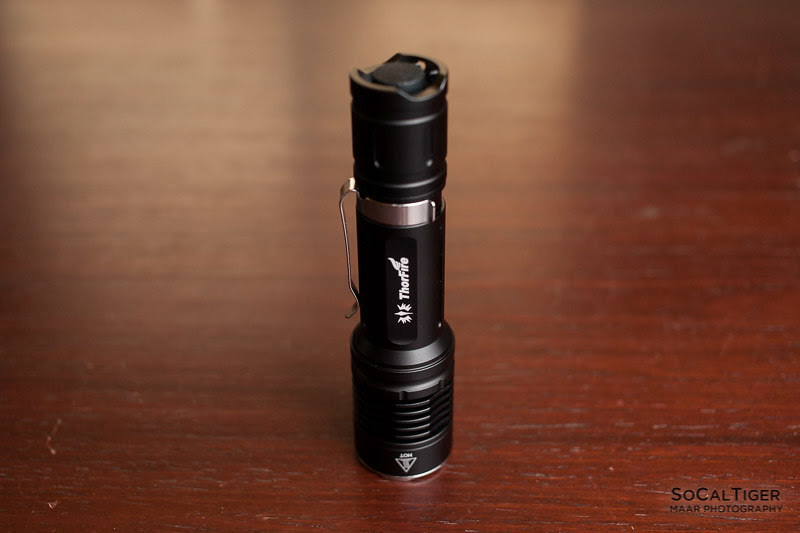 At maximum output, I estimate output is above spec at around 1200+ lumens at 30 seconds. 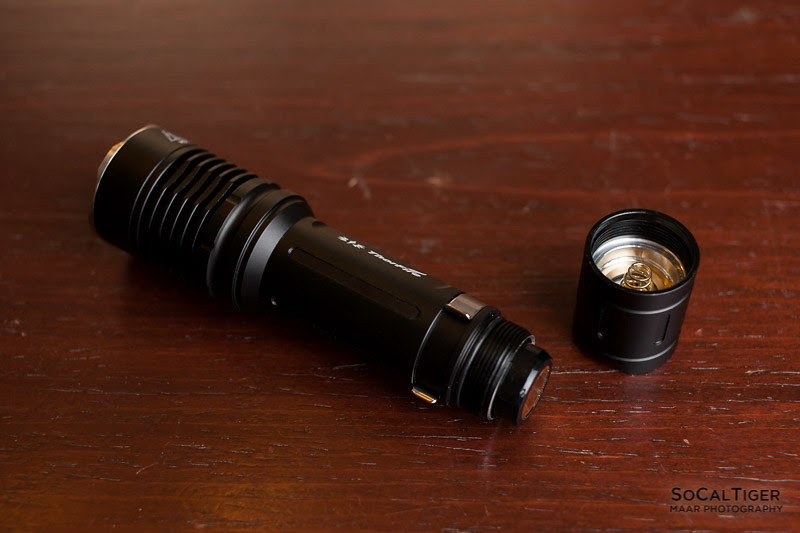 Medium was around 400 lumens. Low was around 90 lumens. Moon was around 0.4 lumens. Comment: I would have preferred Moon to be slightly higher - at least 2-4 lumens. The difference in lumens between Moon and Low is pretty large - 50:1 by spec and 227:1 by my measurements. This light has a timed ramp-down which begins at 5 minutes and slowly ramps-down the power throughout the following 15 minutes. This is a unique ramp-down behavior which I haven't previously seen in a Thorfire light. I decided to overlay the behavior against the TK15 and TK15S for comparison. * The ramp-down is gradual and subtle enough to not really be noticeable in real-world use. This provides a good balance of output while protecting a user from running the light at maximum output continuously. * The light is not really warm by the time it settles on Medium power. Throwy Balanced General Purpose. 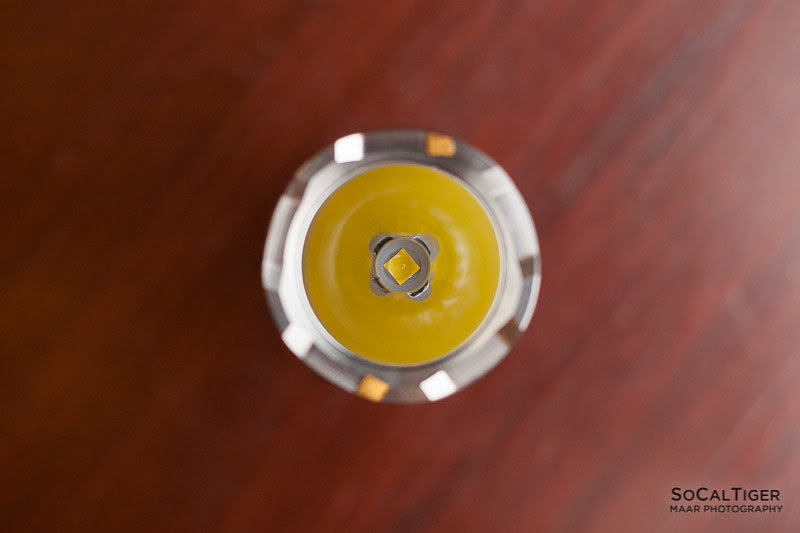 The VG10S uses a domed Cree XP-L2 (most likely the V6 3D shared with the Q8) in a polished reflector. The beam is throwy but still very balanced for general purpose use with a hotspot which transitions smoothly and gradually throughout the beam. The hotspot is not heavily defined. The outer beam has defined edges. This light works very well for people seeking a more balanced beam. This light works great for general purpose use both indoors and outdoors. The VG10S has a very nice warm neutral white of 4500K. When white-balanced in Adobe Lightroom against "Daylight 5500K", the beamshots appear warm. The light appears slightly warm white in practice. This is a very good choice of default color temperature and I'm really happy to see a manufacturer using this color temperature for a light. Like other lights which use the XP-L2 V6 3D, the hotspot is the warmest part of the light and the light becomes slightly cooler towards the edges. However, this is not visible in pictures and even in real life except when aimed at a white wall where the contrast in color temperature can be seen. Protected Batteries Fit. The EVVA Protected Panasonic NCR18650B fits length-wise at 69.5mm and width-wise at 18.67mm. 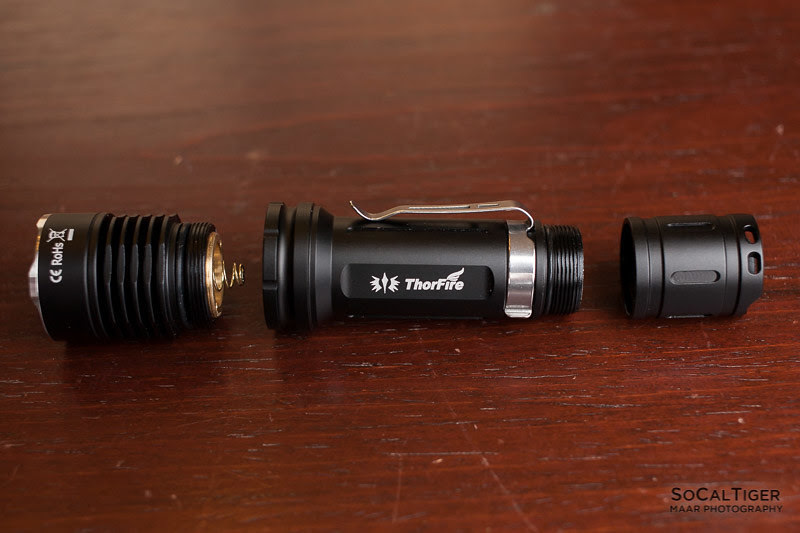 This flashlight actually accommodated protected batteries better than most of my lights. Even though the battery sticks out with the cap off, there was no sensation that the springs were over-tightened at all. The dual springs are very tolerant. If there is a possibility of accidental activation, you should lock-out the light. 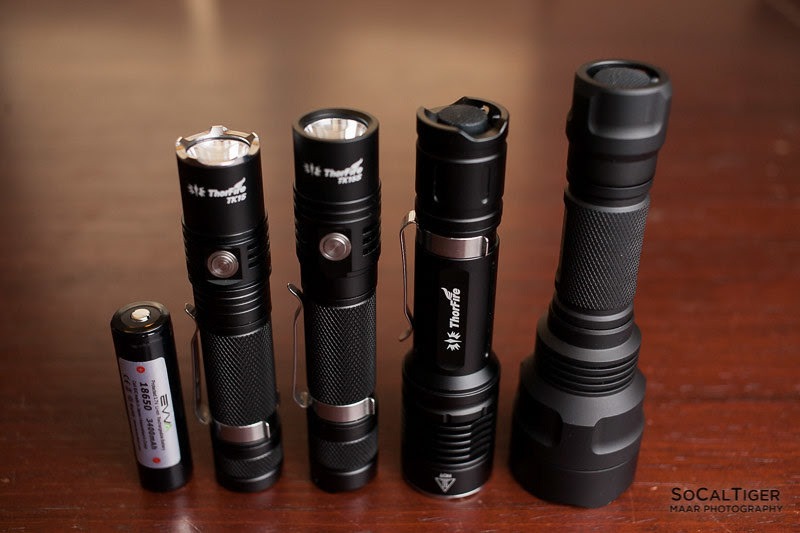 Flashlight pictured next to a 18650, TK15, TK15S and C8 for size reference. Next to TK15 and TK15S. 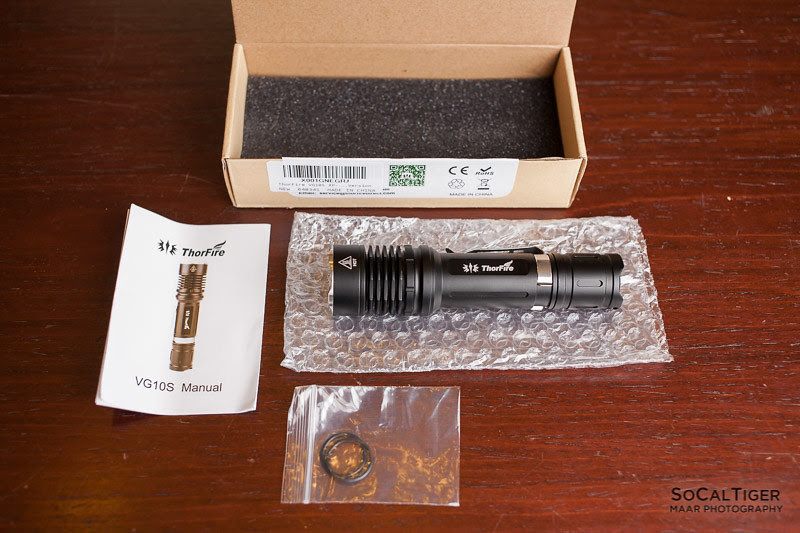 The VG10S is a very good, well-built 1x18650 light which performs above spec at 1100+ lumens on High. 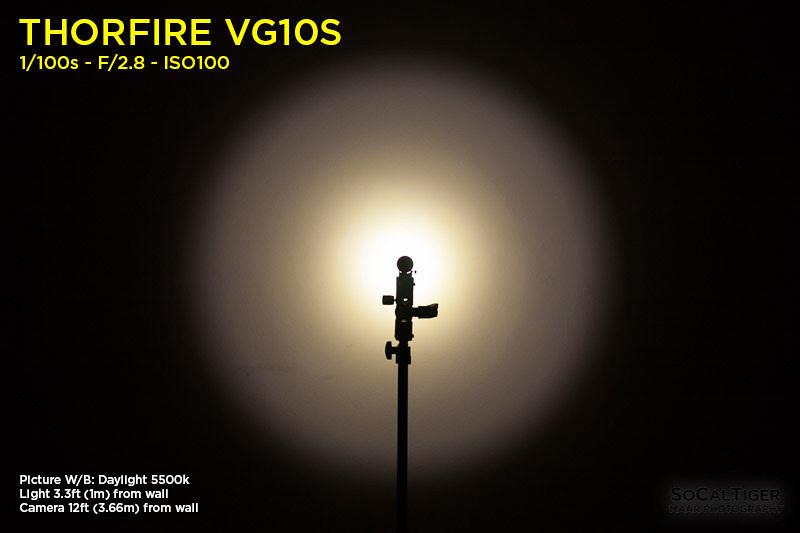 Size-wise, the VG10S is a compromise between a tube light and a larger C8-sized light. 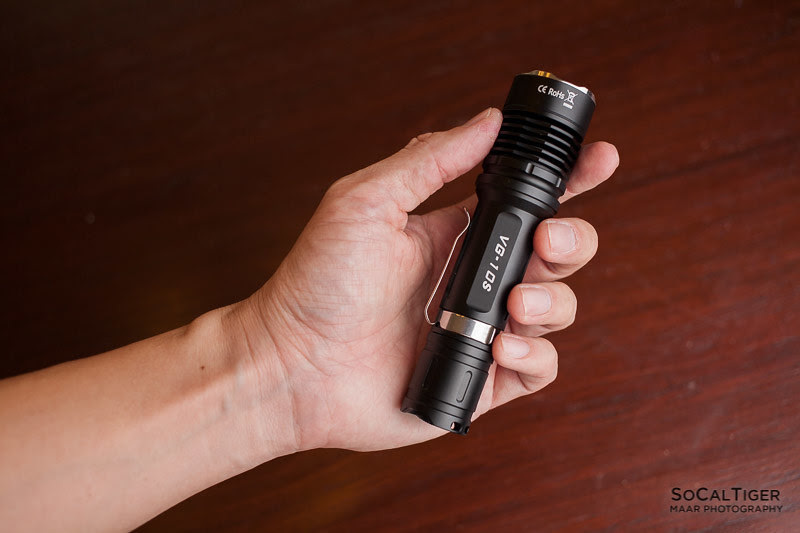 The VG10S will fit fine in larger pockets (like a jacket or cargo shorts) although some may find it a little too wide or too heavy for true EDC use if they are used to using tube lights or smaller. 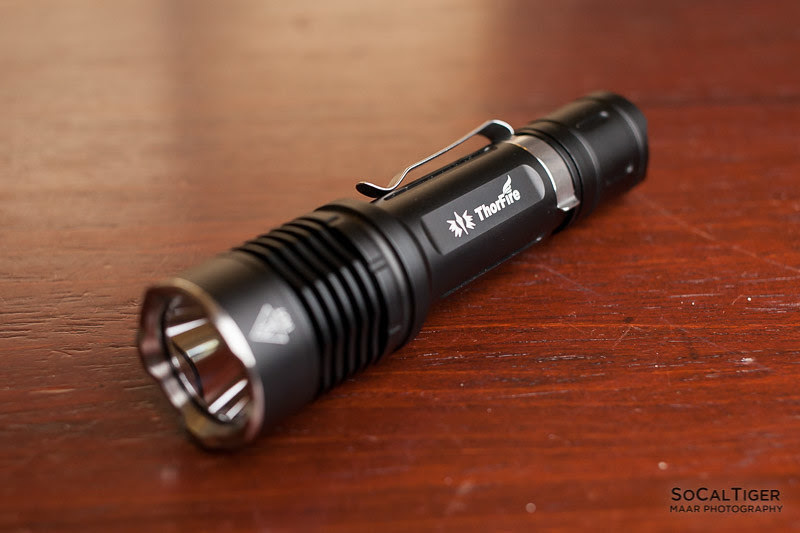 The VG10S has more mass and more cooling fins so it will run cooler than a traditional tube light. So, unlike most tube lights, this light can handle full power better although it does get warm in High mode. 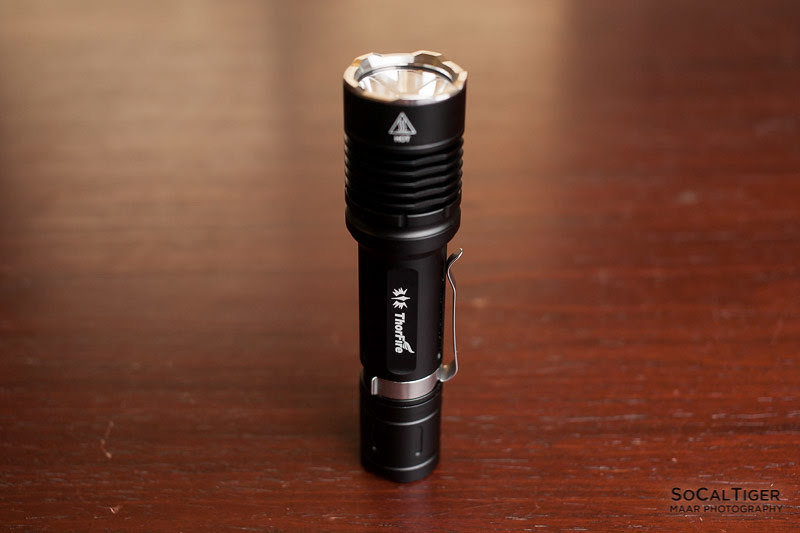 The Medium mode at ~400 lumens can easily sustain longer runtimes with this design and is only mildly warm. For people who mainly use Low or Moon, this light will provide great run times. I like that Moon is not hidden and part of the normal mode rotation although it is dimmer than my preference (I prefer a Moon to be around 2-4 lumens). 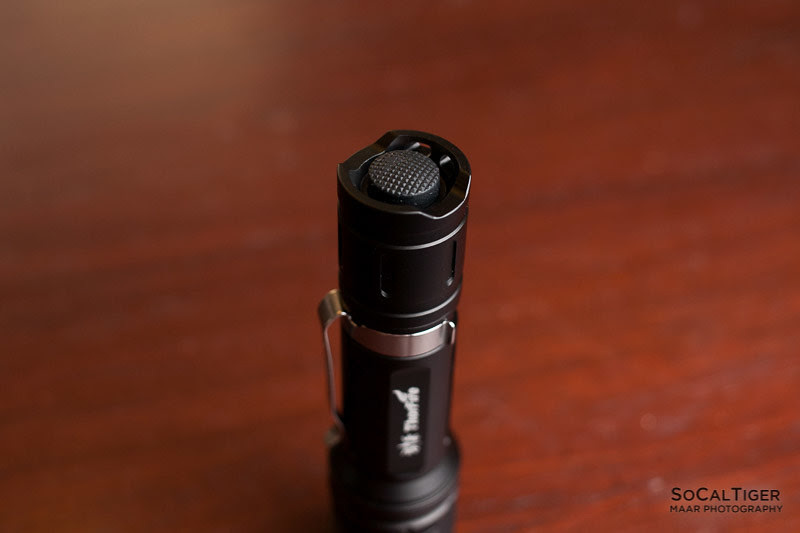 The beam profile is somewhat throwy yet very balanced and is well-suited for general usage. The color temperature of 4500K is perfect and I wish that more manufacturers made lights like this (I do not like cool white LEDs). 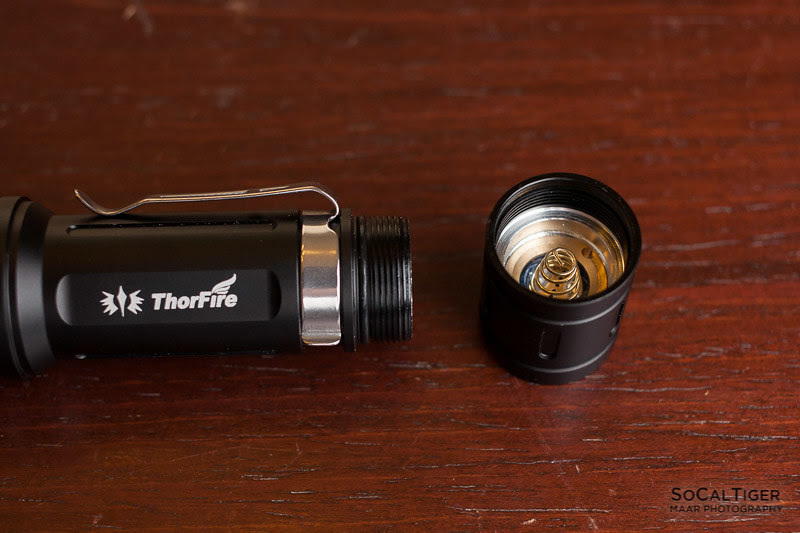 Thorfire gave me a 20% coupon code Link provided by Thorfire. Thanks for the review. I agree with you that it would be great to disable double click for strobe somehow. I would be accidentally activating strobe on this light all the time. Yeah, unfortunately I have accidentally activated strobe with a double-click before on at least a couple different lights. I didn’t do it with the VG10S but it would just be a matter of time. Since this has happened on more than one occasion to me, I always recommend that manufacturers do not do this now. Additional follow-up feedback after using the light a couple more weeks. This light has now replaced the TK15S in my top rotation. I find that it fits really well between a standard tube-class light and something a little bigger like a C8. The beam profile also has practical throw without being too throwy (like a C8 with an XP-L HI). The only one negative that I’ve found is that the battery tube is a little too narrow (not wide enough). In particular this is a problem for using protected GAs. Out of approximately 8 GAs that I own, only 1 can slide in with low resistance – and even that battery is snug. The rest cannot fit it at all or would require too much forcing. However, the length and spring tolerances are PERFECT. 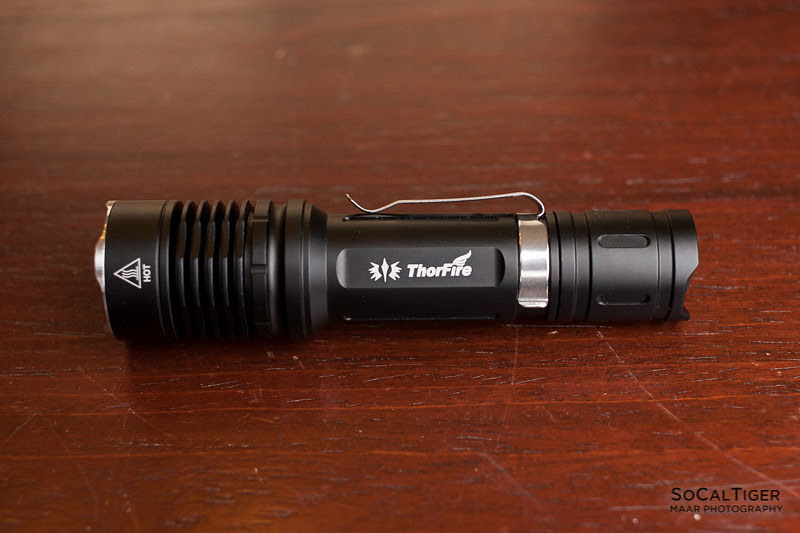 In comparison, a lot of other Thorfire lights like the TK15S have no problem with the width (but have a problem with length). So, I think that the tube of the VG10S needs to be bored out just a tiny bit more to accommodate the width of protected GAs. Considering that the VG10S battery tube is wider than the TK15S, this shouldn’t be a problem. The only other thing that I wish the VG10S had is a side switch. 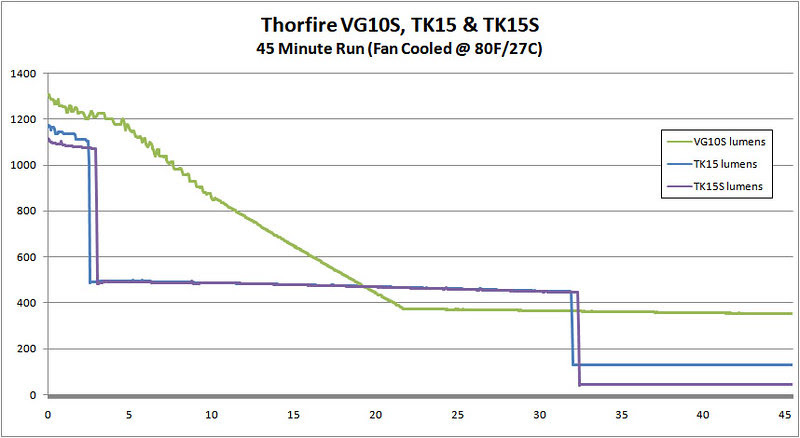 Particularly since I’m comparing coming from the TK15S. Looks like Thorfire are producing some impressive lights st the moment!